This Dubai map covers the 4,114 sq km that makes up the country that comprises one of seven of the emirates known collectively as the United Arab Emirates. 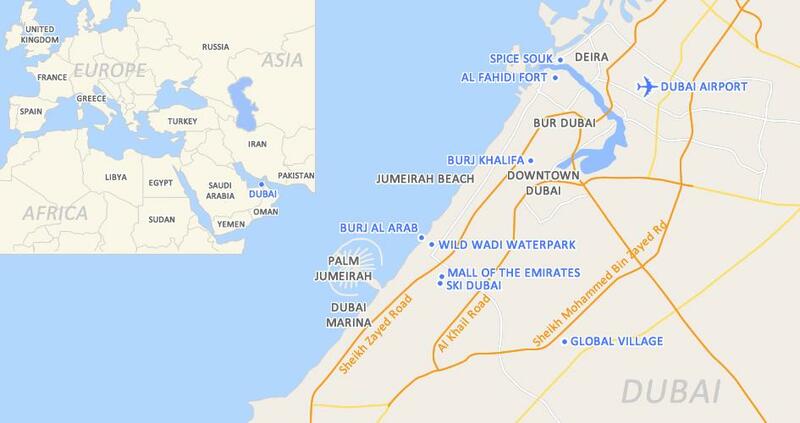 Located on the southeast coast of the Persian Gulf (also known as the Arabian Gulf) the below map also shows the main city, also known as Dubai. Conveniently located just three hours from the Middle East, Near East and India, Dubai is also just five hours from Europe, making it a popular holiday destination with travellers from all over the world. The map highlights some of Dubai’s most popular areas including Downtown Dubai, Dubai Marina, the historical district of Bur Dubai and the beautiful beaches and villas of Jumeirah.